FLASH! Black Is The Color Of My True Love's Hair has been nominated for the 2008 Grammy Awards! Frank is nominated for Best Instrumental Arrangement and is competing against Harry Connick Jr., Steve Wiest, Vince Mendoza, and Gordon Goodwin. The awards will be presented at the 50th Grammy Awards on February 10th, 2008. Orchestral jazz with saxophone improvisations make Emotions a rich and moving experience. Composed by Frank Macchia, the music is performed by the Prague Orchestra, conducted by Adam Klemens. Summary: Taking a complete break from his humorously arranged Animal series of releases, Frank Macchia has put out a recording featuring the juxtaposition of tenor saxophone and orchestra. Not simply a sax and strings release, Emotions is a sumptuous collection of carefully arranged music with Macchia’s tenor saxophone gliding in and out of the well-conceived passages. This is undoubtedly the best mixture of orchestra and horn since Stan Getz’ sojourn with Eddie Sauter on Focus over four decades ago. Each of Macchia’s movements in “Emotions – Suite for Saxophone and Strings” accurately conveys the title of each feeling. The agitated strings on “Anger” are sliced through by Macchia’s biting tenor. “Joy” and “Hope” are sublime and serene, with gentle, yearning nuances supplied by The Prague Orchestra. “Prayer for Earth,” with Macchia’s bass flute floating throughout the piece, is haunting and reverent. Traditional songs like “The Lonesome Road” and “Black Is The Color Of My True Love’s Hair” are given breathtakingly gorgeous readings, and the leader’s sax is a perfect complement – never intrusive nor inhibited. It is a long time since music has been quite so daring, yet so beguiling. Emotions is a surprise release for anyone looking for some fresh air. This is the latest in a series of concept albums from orchestrator and composer Frank Macchia. The acclaimed saxophonist has served as an orchestrator for at least six films so far this year, including Superman Returns and the upcoming Dreamgirls. Cacophony is the primary label for all of Macchia's albums. Not long ago, I had a chance to review his new age-inspired Galapagos release. This time, the title Emotions refers to the primary work on this orchestral jazz-based disc that features the composer on saxophone with members of the Prague Orchestra under the baton of Adam Klemens. You would not have to read Macchia's liner notes to hear Stan Getz's influence in the arrangement of "Black is the Color of My True Love's Hair". In fact, even the title work, a four-movement suite, is reminiscent of some of Getz's work on the classic Focus release on Verve. Macchia's orchestral style also has roots in Eddie Sauter's arranging methods. "Anger", the first movement of the suite, feels a little like Herrmann's Psycho filtered through film noir with a jazz touch. The remaining movements are equally well-shaped and engaging, both in their musical content and in their orchestral colors. The melding of classical orchestral writing with jazz works very well here. This is not a work of improvisations over simple harmonized string backing, but one that uses countermelodies and subtle shadings to bolster the solo line throughout the suite's near 25-minute playing time. The remainder of the disc is filled out with several miniatures. Prayer for Earth is a new age jazz piece with a multilayered recording of a single vocalist and the composer performing synthesizers and bass flute. "Hide and Seek" takes us back to the 1960s, with lush sax and orchestral jazz in a waltz tempo. "The Lonesome Road" is another gorgeously orchestrated improvisation on this spiritual. The other selections, including the upbeat "Bluesentella", are equally engaging. The recording, mastered by Bernie Grundman, is vibrant, with the proper ambience and a clarity that allows for the finest of listening experiences. This is a top-notch release worth tracking down for fans of orchestral jazz, or even those who've worn out their Stan Getz CDs. Jazz meets the symphony on this ambitious enterprise by composer/arranger/saxophonist Frank Macchia and the Prague Orchestra, the inspiration for which was Stan Getz’s album, Focus (Verve, 1961) which Macchia, now in his mid-forties, first heard more than thirty years ago. The centerpiece is Macchia’s four-movement suite for saxophone and strings, Emotions, whose sections represent anger, hope, sorrow and joy. The string orchestra, conducted by Adam Klemens, is divided into six stands of violins, three on the left, three on the right, with nine violas on the left, nine celli on the right, and four basses in the center. It is largely up to Macchia to depict the various “emotions” through his horn, which he does quite nicely, while the strings provide a scenic backdrop, as did Eddie Sauter’s orchestrations for Getz on Focus. While everything is stylishly performed, be advised that this is by no means a standard “big band album.” Tempos are slow to moderate, the orchestra is string-laden, and even though Macchia does improvise, it is always in that context. That’s not say he isn’t an excellent player--he is, sounding almost Getzian at times, especially on the last tracks, “Bluesentella” (a blend of blues and tarantella) and “Elegy.” But in the end, this is an extended symphonic work with jazz overtones. Keeping that in mind, one may find substantial pleasure therein. Frank Macchia’s soulful tenor saxophone stands strong on Emotions in front of the Prague Orchestra, a complement of strings and woodwinds. He takes this opportunity to step out and express a range of emotions that gets things moving. With his big, round saxophone sound, the artist creates images that convince. It’s a powerful range of emotions; from laid-back and lonesome to angry and brash. Macchia’s pure tone and legato articulation provide sorrowful reflections, while his more vibrant interpretations add a joyful aura to the session. The strings color appropriately, as the saxophonist uses original material to express variety. Macchia’s session allows much room for freedom of expression while basing the program on familiar themes. Two of the selections come from the established public domain of Folk music. “Prayer for Earth” differs from the rest of the program, as Macchia picks up the bass flute and works with synthesizers and a lovely wordless vocal accompaniment from Tracy London. Here, his impression remains faithful to the nature of his prayer, but with a decidedly different approach. The remainder of the program proves soothing in its natural approach, fusing strings with the leaders’s big, bold tenor saxophone presence. Macchia enjoys a free-flowing stream of tenor themes that recall the sheer magic of a “Harlem Nocturne” adventure. The enjoyment that he receives through this program of sincere impressions rubs off on those of us who look for sentiment and depth of feeling in that which we appreciate. Frank Macchia, well known for his work as a composer and orchestrator in the worlds of film and television, has received a fair amount of attention in the jazz press for his “Animals” albums. Animals and Mo’Animals are collections that contain entertaining and engaging musical manifestations of different animals, while featuring some heavy hitting musicianship from the likes of Macchia, Vinnie Colaiuta, Bruce Fowler and other top-flight performers. His newest album is a departure from this style. 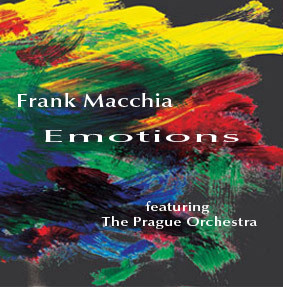 It is on Emotions, Macchia’s latest CD that pairs him with The Prague Orchestra, that he bridges his jazz playing and scoring/arranging skills into one musical ideal. The album begins with “Black Is The Color Of My True Love’s Hair.” This is not your standard “with strings” type of jazz album and the orchestrations are incredibly lush and rich. This traditional song is turned into a cinematic soundscape that provides the perfect back ground for Macchia’s deep tenor saxophone sound. Macchia, who is superb during the statement of the melody, sounds best in the lower register. The strings help to cushion his sound during the first half of the piece and the upper woodwinds help to lighten the feeling mid-tune. “Emotions-Suite For Saxophone and Strings” is a four-part work and each movement is based on a specific emotion. “Anger,” the first part of the suite, features a foreboding sound from the strings during the opening minute. Macchia’s saxophone enters with a piercing and biting sound that definitely transmits aggression and anger. The edge and anger remain throughout, traveling with the group through a waltz-like section of music and a musical storm of notes. Following a cadenza from Macchia, the strings return with an insect-swarming sound that heightens the mood. “Hope” has a noir-ish quality and would be a fine musical companion to the literary works of James Ellroy. Macchia’s tenor playing is warm, delightful and truly inviting throughout this movement. “Sorrow,” equally enjoyable in a musical sense, doesn’t necessarily capture that emotion as well as the first two movements. This section of the suite rides a bit too close to “Hope” in many respects and blurs the line between the two movements. “Joy” stands out as the most distinctive piece in the suite. The catchy, meter-changing riffs, which (to the best of my aural reckoning) are built on movement from 3/4, to 4/4/, to 3/4, to 5/4 and back again, overlap and create a vibrant and, yes, joyful sound. This pattern is the heart of the music and Macchia’s saxophone dances on top to create some magical moments. “Prayer” for Earth,” which is the only piece on the album without the orchestra, features Tracy London on wordless vocal and Macchia on bass Flutes and synthesizers. This work combines a sort of gentle new age sound with a film score-like representation of a rainforest or jungle setting. “Hide And Seek,” while bearing some similarities to “Hope” at the outset, is far more vibrant, contains a more memorable melody and moves in a much firmer jazz direction when the walking bass line starts moving this along. A smooth and sensual quality is emanated from Macchia’s tenor saxophone during “The Lonesome Road.” This particular selection would work well as part of a score behind a love scene (a la Bond movies of the 1960’s and 1970’s) and Macchia clearly knows how to create and maintain this mood. “Dark Corners,” while only veering slightly off the path of the previous tune, has a menacing quality, largely brought on by the harmonic content of the piece, which clearly earns the name of the track. “Bluesentella” is Macchia’s “attempt to marry the blues and the tarantella.” The piece, which moves along with a nice medium-tempo swing feel, tends to sound like a lot of Dave Brubeck compositions and the orchestra is fantastic on this track. Macchia closes the album with “Elegy.” This piece, while slightly mournful, was made from the same cloth as “Hope.” Kudos to Macchia for writing sophisticated arrangements and compositions that utilize his knowledge in the jazz and scoring department.